New York - Governor Andrew M. Cuomo and Mayor Bill de Blasio today announced that Amazon will establish a new corporate headquarters in Long Island City, Queens. The decision followed a comprehensive, year-long selection process during which 238 cities across North America competed for the multibillion-dollar project. In 2019, Amazon will occupy up to 500,000 square feet at One Court Square while working to construct four million square feet of commercial space on Long Island City’s waterfront over the next 10 years, with expansion opportunities for up to 8 million square feet over the next 15 years. Through a $3.6 billion total investment, Amazon will draw from the diverse and talented workforce in New York State to fill at least 25,000 new jobs by 2029 and up to 40,000 jobs by 2034 with an average salary of more than $150,000. The construction is expected to create an average of 1300 direct construction jobs annually through 2033. Overall, the project is estimated to create more than 107,000 total direct and indirect jobs, over $14 billion in new tax revenue for the State and a net of $13.5 billion in City tax revenue over the next 25 years. The project provides a 9:1 return on investment. “When I took office, I said we would build a new New York State - one that is fiscally responsible and fosters a business climate that is attractive to growing companies and the industries of tomorrow. We’ve delivered on those promises and more, and today, with Amazon committing to expand its headquarters in Long Island City, New York can proudly say that we have attracted one of the largest, most competitive economic development investments in U.S. history,” Governor Cuomo said. “With an average salary of $150,000 per year for the tens of thousands of new jobs Amazon is creating in Queens, economic opportunity and investment will flourish for the entire region. “This is a giant step on our path to building an economy in New York City that leaves no one behind. We are thrilled that Amazon has selected New York City for its second headquarters. New Yorkers will get tens of thousands of new, good-paying jobs, and Amazon will get the best talent anywhere in the world. We’re going to use this opportunity to open up good careers in tech to thousands of people looking for their foothold in the new economy, including those in City colleges and public housing. The City and State are working closely together to make sure Amazon’s expansion is planned smartly, and to ensure this fast-growing neighborhood has the transportation, schools and infrastructure it needs,” said Mayor de Blasio. Read the Memorandum of Understanding between the State, City and Amazon here . Last year, Amazon released a Request for Proposals to select one or more locations for additional headquarters operations in North America, leading to an unprecedented competition among more than 230 metropolitan areas. The joint New York City-New York State proposal focused on New York’s unparalleled talent and the capacity of its academic institutions, public schools and workforce training programs to fill the jobs Amazon will create at the pace the company’s rapid growth demands. 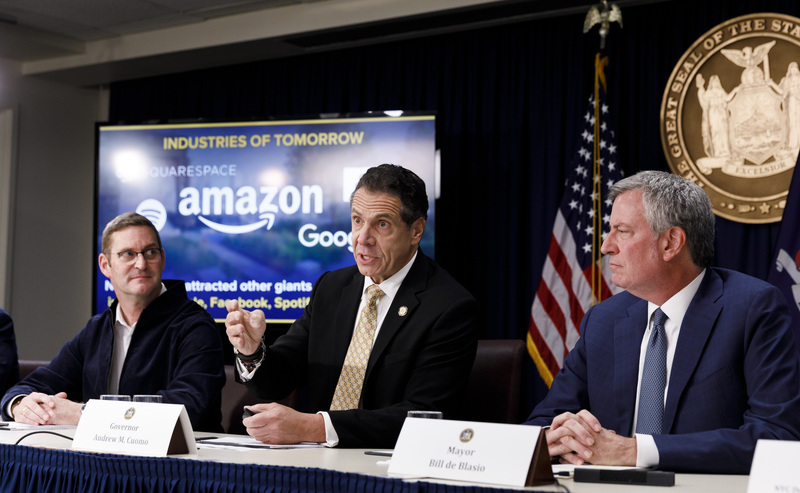 New York State and New York City economic development officials collaborated to submit a robust response and have worked closely with Amazon over the past year on the winning proposal. 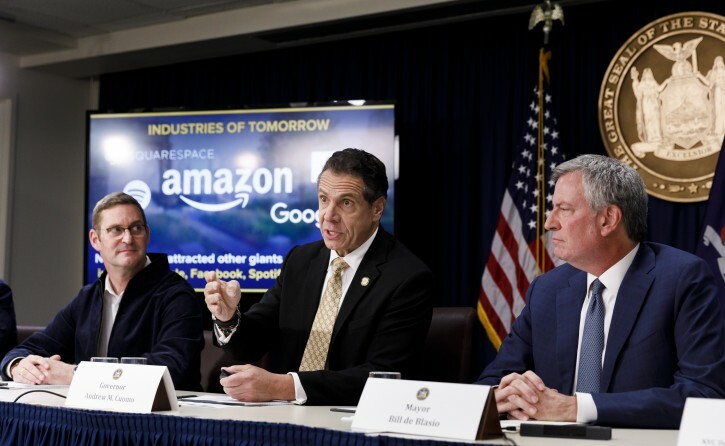 According to an economic impact study by REMI, Inc., a world leader in dynamic forecasting and policy analysis, the Amazon project will generate over $186 billion in Gross State Product for the New York State economy over the initial 25 years. REMI also projects over $14 billion in total new tax revenue for the State (in 2019 dollars), with annual revenues growing from $10.8 million in 2019 to nearly $1 billion in 2043. The City forecasts $13.5 billion in total new tax revenue. The City-State agreement with Amazon includes commitments to build a jointly-funded 10,000 square-foot onsite employment center to connect local residents with jobs and training. A $15 million investment will expand the JobsPlus program to Queensbridge Houses and expand tuition-free tech training to its residents—serving nearly 1,800 residents over the next 10 years. The agreement also secures a new approximately 600-seat intermediate public school, a 3.5-acre waterfront esplanade and park, and the establishment of a Long Island City Infrastructure Fund to invest 50 percent of the project’s PILOT proceeds to deliver on transportation and other neighborhood priorities that will be identified in collaboration with the local community. Empire State Development President, CEO & Commissioner Howard Zemsky said, “This is an enormous win for New York. Having supported all the cities in the state that submitted proposals, we are extremely proud to have brought the largest deal in ESD history to New York State. This once-in-a-lifetime opportunity is a tribute to our world-class colleges and universities across the state, and most importantly it’s a testament to our extraordinarily talented and diverse workforce. New York is a leader in so many disciplines and industries that align with Amazon’s business - including digital media, film production, merchandising, fashion, advertising, ag and food processing, fintech and many more. With a shared history of innovation, New York and Amazon will grow faster and smarter, together. “New York City is proud to be the new home of Amazon’s second headquarters. We feel the same today as we did on day one of the company’s national search: there is no city in North America better equipped for HQ2 than New York,” said NYCEDC President and CEO James Patchett. To bring this transformational, multibillion-dollar project to New York, the State offered a package of performance-based incentives totaling $1.705 billion. The package includes a $1.2 billion in tax credits through the Excelsior Jobs Program, which is directly tied to Amazon’s commitment to create 25,000 new jobs and no less than $2.3 billion investment over ten years as well as a $505 million capital grant that is directly tied to Amazon’s commitment to invest $3.6 billion and create up to 40,000 new jobs over 15 years. Additionally, the company, State and City are committing $15 million - $5 million each - to create new workforce development programs focused on technology training and recruitment specific to New York City and targeted toward underrepresented segments of the workforce. Programs supported by this initiative may include community-based accelerated technology training programs, internships, and work-based learning opportunities for high school students. Under pre-existing as-of-right programs authorized by law, Amazon is eligible for a partial property tax abatement through ICAP and an annual credit of $3,000 for twelve years per eligible employee under REAP, a program available to all companies to encourage job growth outside of Manhattan. REAP benefits for Amazon’s 10-year expansion are projected at $897 million through 2038, and ICAP will abate approximately $386 million. Long Island City is one of the fastest-growing neighborhoods in the five boroughs. To meet the needs that come with new residents and new jobs, the City has steadily increased its investment in the area’s infrastructure. All told, there is more than $2.4 billion of planned infrastructure investments across the neighborhood, including a $180 million investment that was recently announced by the City for new schools, open space and transportation. The State and City will collaborate with the company and local community to conduct an environmental review and develop a General Project Plan, as is typically done for large City-State development projects, including nearby Queens West. A Community Advisory Committee will be established, which will include representatives of the State, City and local elected officials. In addition, longtime community developer Plaxall will advance development on adjoining waterfront sites that will include planning that complements Amazon’s new headquarters. The project is subject to the State’s minority and women-owned business enterprise laws and utilization goals. New York State has set the nation’s highest goal - 30 percent - for utilization of MWBEs. Amazon has already made several key investments in New York City. The company has a sizable presence throughout the five boroughs, including existing corporate offices, a distribution and fulfillment center on Staten Island, and retail space in SoHo. Earlier this year, Amazon signed a lease for 360,000 square feet of commercial office space on the far West Side of Manhattan. In addition, Amazon recently purchased the 83,000-square-foot building in Woodside to develop a second fulfillment center, substantially expanding its New York City footprint and creating over 2,000 jobs. Comparing federal tax policy where the US controls its border which gives it tremendous clout over whether businesses need to be in the US or not, versus State tax policy, where the Commerce Clause essentially prevents States from regulating much interstate commerce, is a false equivalence. That said, I personally think both cutting the corporate tax rate and giving tax breaks like this are bad policy. I do not think increasing the deficit and using tax policy to overheat the economy is a wise idea, hence my criticism of Trump. Keynesian economics are easy to forget when the economy is booming. As to the State and local tax breaks, it is the unfortunate result of the need for States to compete, which is exacerbated by the Commerce Clause, meaning that to prevent such tax breaks from being unfairly handed out, will take either a federal law or a constitutional amendment, which is not going to be an easy thing. “ Comparing federal tax policy where the US controls its border which gives it tremendous clout over whether businesses need to be in the US or not, versus State tax policy, where the Commerce Clause essentially prevents States from regulating much interstate commerce, is a false equivalence. Tex breaks boost the economy and are revenue neutral to the Feds . Furthermore I don't think govt programs and Medicaid which increase the deficit are good ideas either . Lots of more people are now hiring and businesses are flourishing bec of tax breaks . If you are so worried about the deficit offer a tax break and cut govt spending on those wealthy low income people who bring in more money than your middle class accountant on a net income basis .